When the temperature outside plummets, it can cause major problems inside your home. Frigid temperatures can cause pipes to freeze and possible burst, resulting in flooding and expensive water damage. While there isn’t anything you can do to stop the temperature from falling, there are several steps you can take to prevent pipes from freezing in your home. Pipes in certain parts of your home are more likely to freeze than others. Pipes running through unheated areas, like basements and attics, are at risk. If you have an older home, pipes running along exterior walls are also more likely to freeze than those in other areas in your home. Here are a few ways to keep the pipes in all areas of your home from freezing. Before the temperature outside plummets, you may want to invest in some insulation. Foam tubes to insulate pipes are inexpensive and easy to install. You may also want to consider adding extra insulation in your walls or in your basement or attic. 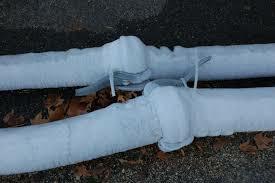 Inadequate insulation is a major cause of frozen pipes and is the likely culprit if your pipes freeze every year. When it’s cold, there are a few steps you can take to reduce the likelihood of your pipes freezing. Open the cabinets below your sinks, especially if the plumbing to those sinks runs along an exterior wall. Moving water doesn’t freeze, so on particularly cold days, it’s a good idea to leave your faucets running at a slow drip. If you plan on being away for an extended period of time this winter, leave your thermostat set no lower than 55 degrees. Turn off your main water supply before you leave, and drain the system by flushing the toilets and draining all faucets. If you need frozen or burst pipe repair in Macedon, depend on G.T. Campbell Plumbing. Our plumbers in Macedon offer fast, professional plumbing repair and you can count on them to solve your problem in the most efficient manner. Call 585-548-0004 today!